The historic Concrete Theatre was first opened in 1923. Over the years it has offered silent movies, “talkies,” vaudeville, even boxing matches. It is now the oldest operating theatre in Skagit County. Owners Valerie Stafford and Fred West purchased the Theatre in 2009, and refurbished and reopened it in February 2010. There are movies every weekend, along with live performances and a variety of special events throughout the year. The venue is the home of the annual “Concrete Ghost Walk,” and also offers holiday events, special presentations, and meetings of local organizations. 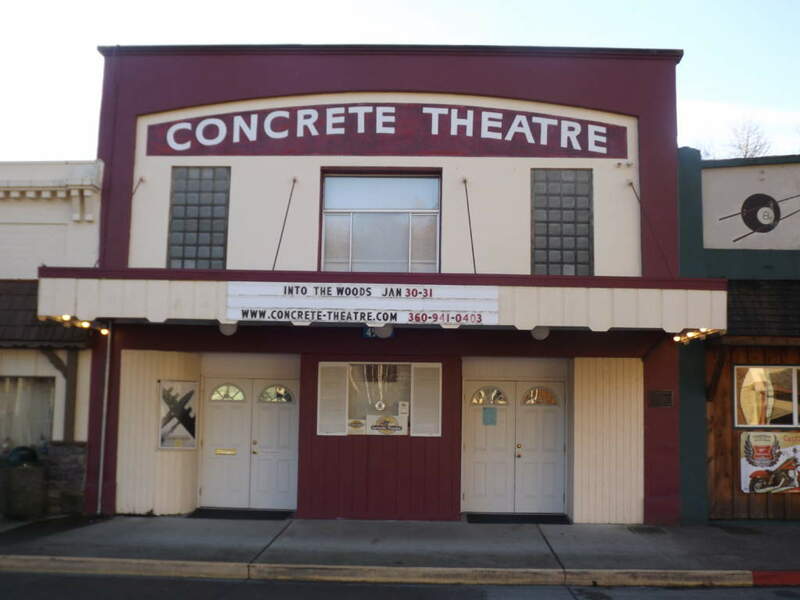 When the movie industry “went digital,” supporters and local residents raised more than $50,000 to keep the Concrete Theatre open. The theatre now has a top-notch digital projector, Dolby surround sound system and other new equipment that allows audiences to enjoy an amazing movie experience in a small, friendly setting. Adults 65 and older: $7. Children 12 and under: $7. 3D showings at no additional cost. For movie titles and schedules, call the 24 movie line: (360) 941-0403 or visit the website. In addition, the Theatre is home to Encore Fitness, offering a variety of group exercise classes, including cardio, strength and Zumba. Encore Fitness also provides online coaching for wellness and weight loss. For information, contact Valerie Stafford.